Sunday Quote!- The Invention of Religion | J.W. Wartick -"Always Have a Reason"
The notion that religion is a socially constructed concept is essential to Cavanaugh’s work, and he argues meticulously towards this end. His point is not that all so-called “religions” are false. Rather, his point is that the notion that there is such a thing as a secular/religious dichotomy is itself a construct with a historical development. Moreover, this construct, he argues, has been useful for creating an “Other” who is then deemed “religious” in order to separate this Other from spheres of influence. It’s a highly interesting book, and one I recommend strongly. I have reviewed it here. What do you think? How might you define “religion”? If Cavanaugh is right, how might this notion influence your thought? 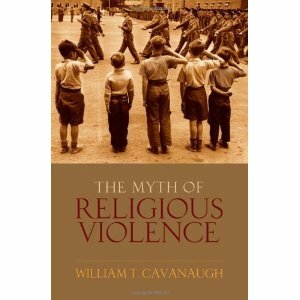 The Myth of “Religion”: Constructing the Other as an enemy– Here, I draw out more of Cavanaugh’s claims regarding the usage of the term “religious” and how it is used at times to create an “Other” to repudiate. « Really Recommended Posts 4/25/14- Dean Koontz, egalitarianism, “Cosmos,” and more! This sounds like a fascinating book. It is common for secularists to create a religious “other” so they can set religious people apart as different and then worse than they are. It really is fascinating when one delves into it. Thanks for reading! This sounds quite interesting. I’ll have to be on the look out for it. It is one of my favorite books ever. That’s saying something! I honestly think that the (atheist) sociologist Emile Durkheim’s definition of religion as “a unified system of beliefs and practices” is about as useful a definition as we’re likely to get (that covers even just today’s major world religions), and one that acknowledges that there is no Other religious/secular dichotomy. All belief-systems are essentially religious and many seemingly ‘secular’ ideas are held sacred like democracy, human rights, scientific method et cetera. Additionally, people tend to have multiple complementary (and even competing) belief-systems as part of their personal religion whether or not they subscribe to traditional public religion like Christianity or Buddhism. That’s an interesting definition! How does Durkheim deal with the notion that such a definition essentially makes the category of “religion” as separate from other spheres of life meaningless? Well, Durkheim thought that religions focusing on an external figure, like God or gods (or whatever) were really substitutes for society, in that people instinctively knew that there was something bigger than them that they were part of but that that thing was really society. Therefore, religion and society were essentially the same. Durkheim referred to a society of believers (of any religion) as a church, which makes his ideas a kind of ‘secular’ ecclesiology. What I find particularly fascinating about this is that if still makes sense if you are a believer (as I am) and cannot accept that society is being mistaken for God because it means that religion is a part of human life at a basic level that cannot be done without because it is the way that human beings think and function socially. It becomes especially interesting in the context of the Church-as-the-Body-of-Christ theology/ecclesiology or even just the idea of seeing Jesus Christ in the faces your fellow human beings (which is made most pointedly in the Gospels of Matthew and John. Tolkien’s idea of Christianity as True Myth (as opposed to fractured, mostly false myths like those of Greek or Norse mythology) would be a similar idea from an Christian-aesthetics perspective rather than Durkheim’s atheistic-sociology perspective; combined we think in stories which shape ourselves and our society (which then tells our story). Interestingly, there are plenty of examples where people have been deliberately guided towards worshiping the idea of a society itself in an overtly religious way. Nationalism, like the way in which the flag, constitution and pledge of allegiance in the USA are taken sometimes is practically indistinguishable from religious worship in the degree of reverence accorded, though it is relatively innocuous (usually). More extreme (and dangerous) examples would be the explicit state-and-leader worship of Soviet Union and Nazi Germany. Cavanaugh is right. It always seemed so odd to me, that if Christianity is truth, if Jesus Christ is real, that we could compartmentalize life that way modernity does. I agree. It seems there is no reason to try to separate (artificially) one’s “belief” from one’s “life” as though those were two different areas of operation.